What is an AC joint separation? The shoulder joint is formed at the junction of three bones: the collarbone (clavicle), the shoulder blade (scapula), and the arm bone (humerus). The scapula and clavicle form the socket of the joint, and the humerus has a round head that fits within this socket. The end of the scapula is called the acromion, and the joint between this part of the scapula and clavicle is called the acromioclavicular joint. An acromioclavicular joint separation, or AC joint separation or shoulder separation, occurs when the clavicle separates from the scapula. It is commonly caused by a fall directly on the ‘point’ of the shoulder or by a direct blow received in a contact sport. Is a shoulder separation the same as a shoulder dislocation? No! These two injuries are commonly confused, but they are very different conditions. 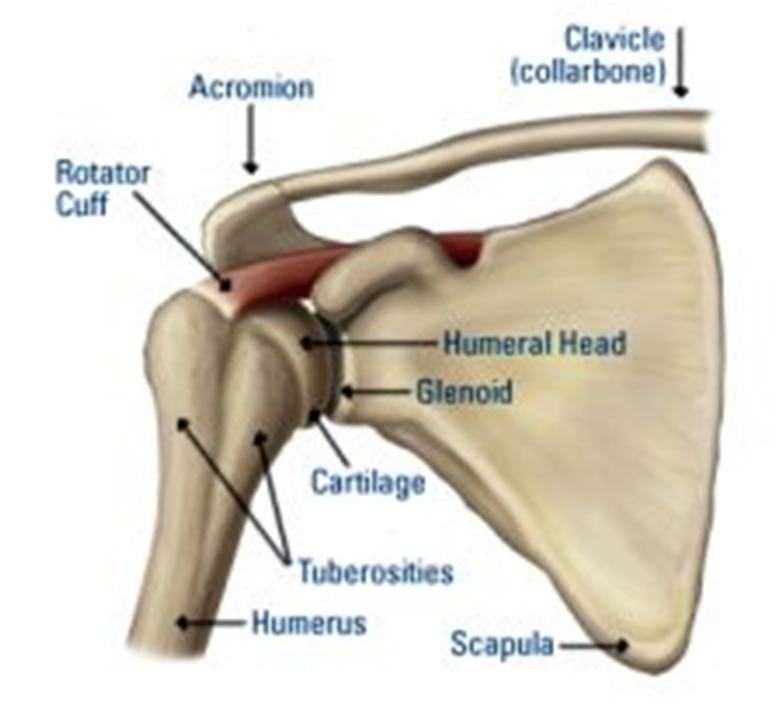 As described above, the shoulder joint is located at the junction of three different bones: the clavicle, the scapula, and the humerus. In a shoulder separation, the junction of the clavicle and scapula is disrupted. In a shoulder dislocation, the humerus (arm bone) is displaced from the socket. Not only are the injuries different in anatomical terms, but the implications for treatment, recovery, and complications are also different. What causes an AC joint separation? A shoulder separation is almost always the result of a sudden, traumatic event that can be attributed to a specific incident or action. The two most common descriptions of a shoulder separation are either a direct blow to the shoulder (often seen in football, rugby, or hockey), or a fall on to an outstretched hand (commonly seen after falling off a bicycle or horse). What are the typical symptoms of AC joint separation? The diagnosis of shoulder separation is often quite apparent from hearing a story that is typical of this injury, followed by a simple physical examination. An x-ray should be performed to ensure there is no fracture of these bones. If the diagnosis is unclear, an x-ray while holding a weight in your hand may be helpful. When this type of x-ray is performed, the force of the weight will accentuate any shoulder joint instability and better show the effects of the separated shoulder. Are all separated shoulders the same? in a sling or an immobilizer. Type II – Complete tearing of the acromioclavicular ligament, as well as a sprain or partial tear of the coracoclavicular ligaments. This often causes a noticeable bump on the shoulder which is permanent. Severe pain and loss of movement are common. Treatment is typically an arm sling, bed rest, ice and heat therapy, and anti-inflammatory drugs. Most people recover full motion of the shoulder and arm within 6 to 8 weeks, often with the assistance of physiotherapy. Type III – Both acromioclavicular and coracoclavicular ligaments are torn. A significant bump, resulting in some shoulder deformity, is formed by the end of the clavicle. This bump, caused by the clavicle’s dislocation, is permanent. The clavicle can be moved in and out of place on the shoulder. It may take as long as 12 weeks for the injury to heal and in some cases even longer for shoulder strength and range of motion to feel normal. Physiotherapy can be beneficial. 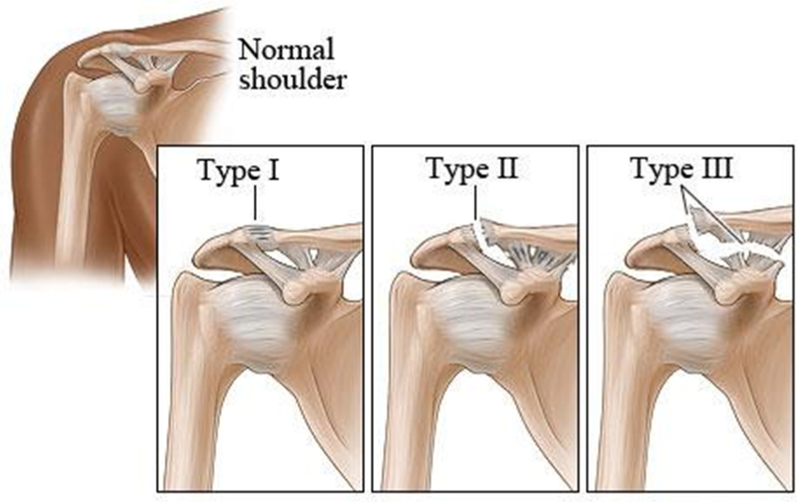 Type IV – An unusual injury where the clavicle is pushed behind the AC joint. Type VI – Exceedingly rare. The clavicle is pushed downwards, and becomes lodged below the corocoid (part of thescapula). Icing the Injury – The inflammation from a separated shoulder can be controlled with ice placed on the joint every four hours for a period of 15 minutes. Icing can be done for the first several days until the swelling around the joint has subsided. Rest – In the acute stage, together with a protective sling and ice, rest can help to reduce the pain and swelling. Resting the joint will help minimize painful symptoms and allow healing to begin. Physiotherapy – A rehabilitation program will aim to restore the normal motion and strength to the shoulder. This will begin as soon as tolerated. Returning to sporting activities can occur within 2 to 12 weeks depending on the grade of separation. Anti-inflammatory Medications – These medications may assist with the reduction of swelling and pain within the affected shoulder. Depending on the severity of the joint separation, surgery may be necessary. 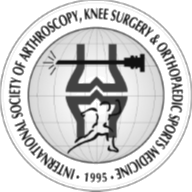 Surgery is also an option for those AC joint separations that have not responded well to non-operative treatments. A variety of surgical methods can be considered to stabilise a separated AC joint, and these will be discussed individually with your surgeon. 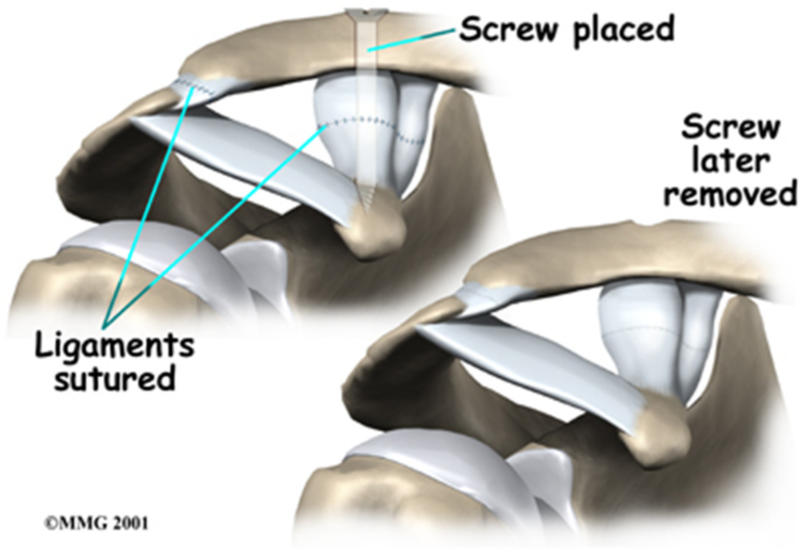 Common reconstructive surgical techniques today use either a screw or suture loop, and on some occasions an artificial ligament is used. If you don’t need surgery, range-of-motion exercises should be started as pain eases, followed by a program of strengthening. Full recovery can take up to six weeks for Type II separations and up to twelve weeks for Type III separations. Since there is little danger of making the condition worse, you can usually do whatever activities you can tolerate. After surgery, your surgeon may ask you to wear a sling to support and protect the shoulder for a few days. A physiotherapist will probably direct your recovery program. Physiotherapists usually wait four weeks before starting range-of-motion exercises. You will usually begin with passive exercises where the shoulder joint is moved but your muscles stay relaxed. Your physiotherapist gently moves your joint and gradually stretches your arm. You may be taught how to do passive exercises at home. Active therapy starts six to eight weeks after surgery, once the ligaments have healed.Active range-of-motion exercises help you regain shoulder movement using your own muscle power. You might begin with light isometric strengthening exercises and gradually move onto more active strengthening exercises. Recovery from shoulder surgery can take some time. You will need to be patient and closely follow your physiotherapy program.